The vitreous humor is the clear, jelly-like substance in the main chamber of the eye, located between the lens and the retina. At a young age, the vitreous is perfectly transparent. Over time as the eye ages, this vitreous humor can degenerate, loosing its form and liquefying. Without the stable vitreous humor, the collagen fibers collapse and bind together to form clumps and knots. It is these fibers, which cast shadows on the retina and appear as spots, strings, or cobwebs that are commonly referred to as “floaters”. In many cases as the eye ages further, the vitreous humor can peel away from the retina entirely. This is known as Posterior Vitreous Detachment (PVD). PVD is often associated with a sudden increase in the number of floaters. Floaters are small pieces of debris that float in the eye’s vitreous humor. This debris casts shadows on to the retina (the light-sensitive tissue layer at the back of the eye). If you have floaters, it is these shadows that you see floating across your field of vision. Most common in young people, this thin, dense floater can appear as multiple dots and/or string-like cobwebs and are a result of clumping of the collagen fibers of the vitreous. Depending on its size, and where it is located, it may be treatable with vitreolysis. This cloud-like floater is caused by the natural aging process. Whilst this type of floater can sometimes be treated with vitreolysis, it often requires more overall treatment in order to obtain satisfactory results. 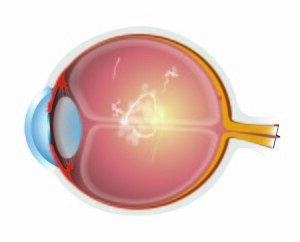 A Weiss Ring floater is a large, ring-shaped floater that forms as a result of PVD when the vitreous cortex pulls off the posterior wall, taking with it some of the fibrous vitreous cortex that surrounds the head of the optic nerve. This floater is usually located safely away from the crystalline lens and the retina and is fibrous. Because of this, it can be treated safely and effectively with vitreolysis.